The slide will lock open after the last round in the magazine has been fired. The unique patented magazine design and heat-treated steel lock open insert allows the manufacturer to offer this special and desirable feature which you can only find on 'Advantage Arms' .22LR GLOCK conversion kits. Glock incorporated an internal firing pin safety into their guns. Advantage Arms includes it on the conversion kits as well. The internal firing pin safety is designed to eliminate accidental discharges from dropping the firearm. The Glock Conversion Kits are made to work on FACTORY STOCK Glock frames. The Manufacturer highly recommends Remington "Golden Bullets" for everyday plinking and CCI MiniMags or Federal Automatch for better accuracy. 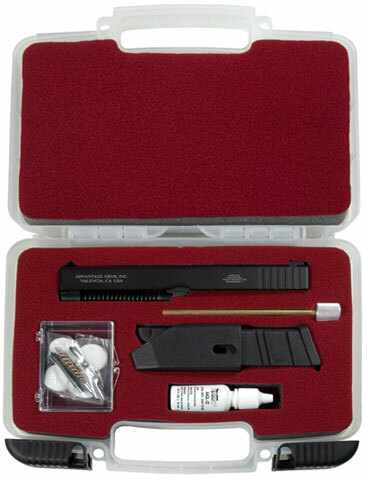 PLEASE NOTE: THIS KIT IS ONLY FOR USE ON GENERATION 3 GLOCK 17 OR GLOCK 22 PISTOLS.